For the 1st time since the process of NHL expansion in 1997 and the Minnesota Wild & Columbus Blue Jackets hitting the ice in 2000, Las Vegas Nevada is finally getting a pro sports franchise. Playing in the “Desert of Excess” 15 months from now, the NHL Board of Governors unanimously approved expansion for Bill Foley’s Black Knight Sports & Entertainment Group for the 2017/2018 season with an added $500 million expansion fee. At almost 2PM Pacific Time yesterday afternoon, Commissioner Gary Bettman followed the Vegas news with the deferment of Quebec City’s expansion proposal. The three issues that slowed down a pro hockey return to French Canada are the recent fluctuation of the Canadian dollar, already having 16 teams in the Eastern Conference, and concerns about the NHL Expansion Draft. Mr. Bettman didn’t expound on these concerns, which I assume are related to team losing multiple players to expansion. Many fans hoping for the New Nordiques took to Twitter with anger and frustration over being passed over yet again. Despite an amazing turn-around by the South Florida franchise with Gerard Gallant at the helm, it’s hard to beat winning the President’s Trophy. Barry Trotz took home the top coach award last night by leading the Capitals to a 56-18-8 record. I thought Boston’s Patrice Bergeron was going to follow in the footsteps of Norris winner Doughty, as he’s been such a consistent two-way playmaker over much of his career. Not only did the Kings Anze Kopitar edge out Bergeron in the closest vote of the night, but also was named the most gentlemanly in the league with only 16 penalty minutes and a plus 34 rating. On media day I asked the Selke runner-up on his future goals. 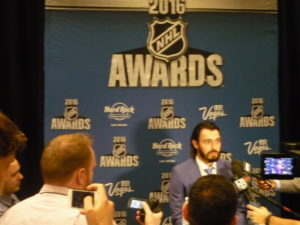 Bergeron answered humbly. 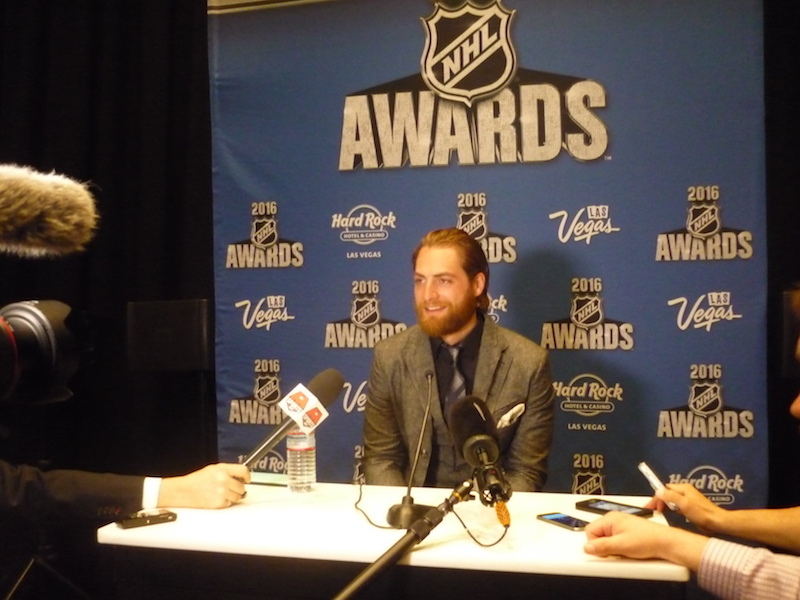 Even though Tampa Bay’s Ben Bishop lead the league in Goals Against Average and Save Percentage, Washington’s Braden Holtby won the award as the media darling for most of the season. But his 48 wins, tying him with Martin Brodeur for most wins in a season, was remarkable- even more so playing in 12 less games than the great Devils goaltender. 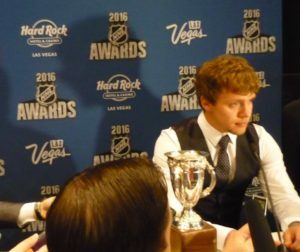 Edmonton fans rallied behind their standout rookie Connor McDavid, but the overwhelming favorite was Artemi Panarin of Chicago. A transplant from the Russian KHL, the 24 year old placed ninth in the league with 77 points. I asked him through his translator how many times and when was the last time he was in Las Vegas, along with his favorite food. 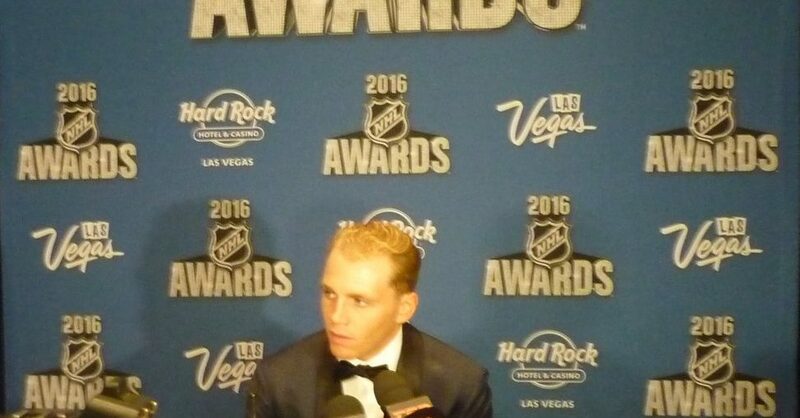 Patrick Kane ended a 38 year drought for the Chicago Blackhawks for the Awards biggest honor, notching career highs in goals and assists. The Buffalo native is the first ever U.S. born and raised hockey player to win the scoring title and league MVP. Kaner scored a hat trick Wednesday night, winning the Ted Lindsey Award voted on by the players and the Art Ross for leading the league in scoring. The 27 year old won the MVP award on ironically his 9th anniversary of being drafted into the league. Follow Russ Cohen and Sportsology starting later today in Buffalo for coverage of the 2016 NHL Draft.